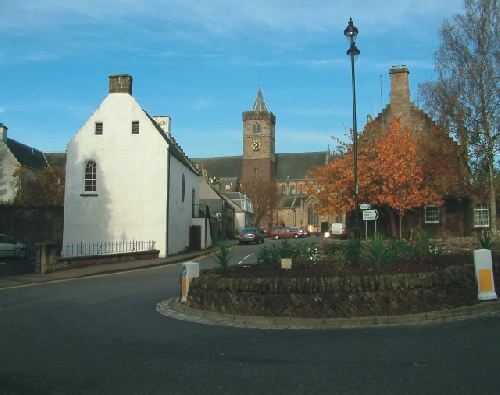 The cathedral town of Dunblane a short ten minutes drive from the City of Stirling. Here we have put together a short trail with the assistance of the Dunblane Local History Society with special thanks to Janice Ainsley. 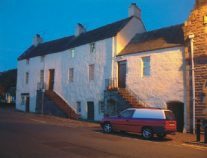 The name Dunblane probably comes from 'dun' or stonghold of St Blane (an early 7th Century missionary). In the Middle Ages it was the centre of an extensive bishopric with a magnificent cathedral that still dominates the town today. 2. The Cross, this is where the Mercat Cross would have stood and the weekly market and annual fairs held. the lower part of the cathedral tower is the oldest surviving part dating from the 12th century. The main cathedral was built by Bishop Clement in the middle of the 13th century. 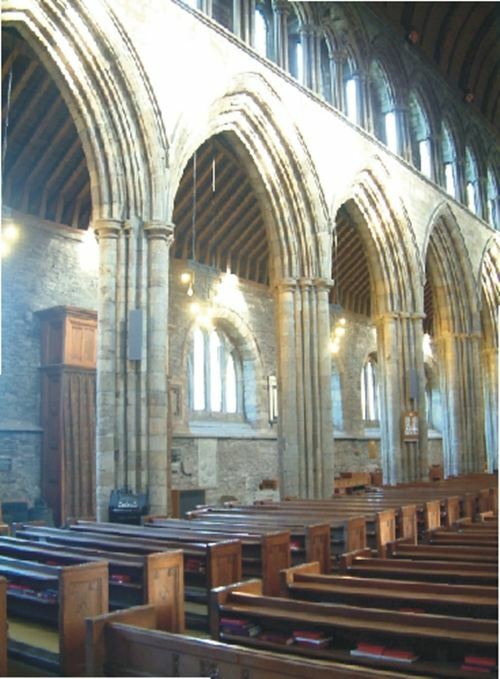 After the reformation in 16th century the nave roof collapsed, but the chancel continued to be used as the parish church with 'lofts' or galleries being added to accommodate the congregation. The cathedral was fully restored in 1893.
you will see some of Scotland's finest Medieval carved woodwork as well as the 20th century carved pulpit, choir stalls, reredos screen and the Flentrop organ case. In the Choir there are three blue slabs set in to the floor to commemorate James IV's wife Margaret Drummond and her two sisters who were poisoned allegedly by some nobles who wanted the King to marry Princess Margaret of England. 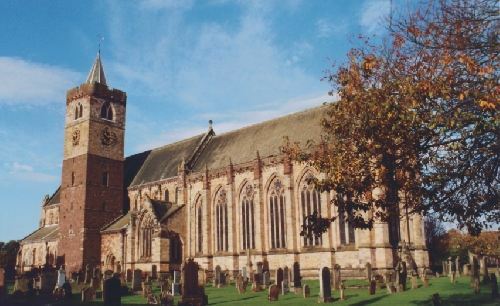 Dunblane Cathedral is open April to September daily 9.30am to 6pm, Sundays 2 to 6pm. October to March to 4pm. 4. The Bishop's Palace, here you can see all that is left of the once extensive medieval palace, last inhabited in 1579. 5. On your left you will see a stone pillar in the middle of the grass, this was the town's 'bleaching green' in the 19th century and prior to that the Palace Gardens. 6. The Town's Meal Mill was located at the end of Mill Row, hence its name today. This was the original route in to Dunblane dating back over a thousand years. The ford across the Allan Water would have been beneath the present bridge at the end of Mill Row. 7. The Old Bridge was built by Bishop Finlay Dermoch in 1410 and widened in the 19th and 20th centuries. If you look carefully under the arch of the bridge you will be able to see two distinct styles of stone work, the original being faced in yellow sandstone. 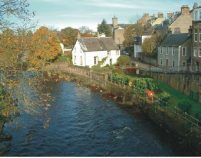 This is the large white building nearest the bridge as you look upstream and was built in the late 18th century as a worship place for the 'Auld Lichts' a break away sect from the established church. The large windows let the day light in to the church, the rest of the building was the minister's living quarters. 9. The Stirling Arms Hotel was built in the 18th century accommodating Robert Burns, Scotland's National bard in 1787. It is interesting that he had obtained an appointment as excise (customs) man in Dunblane, but died before taking up the post. 10. The High Street developed in the 15th century following the erection of the bridge. All traffic passed north along High Street until the early 20th century. It must have been a busy place! Dunblane Community web site gives a lot of detailed information on Dunblane.